Just because a company puts up a website and starts advertising kitchen exhaust hood cleaning services doesn’t mean they are qualified or professional. Here are some of the hallmarks of a professional kitchen exhaust hood cleaning company that you can actually trust to get the job done right every time. IKECA stands for International Kitchen Exhaust Cleaning Association. This organization provides certifications and continuing education resources for professional exhaust system cleaning technicians. When a company has IKECA membership, this signifies that they hold their technicians to a high standard and expect them to not only complete their individual IKECA certifications, but also keep those certifications active through continuing education. Therefore, an IKECA member company is able to provide truly professional kitchen exhaust hood cleaning to their clients. 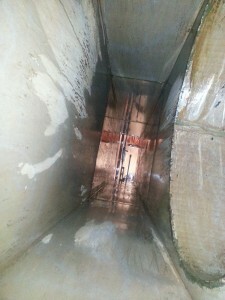 Many cheap exhaust hood cleaning companies focus exclusively on hand scraping. This is the easiest way to clean a kitchen exhaust hood, and it’s possible to do a passable job of hand scraping with very little training and no certifications. However, a professional kitchen exhaust hood cleaning company will not only do a better job of hand scraping, they will also offer other cleaning methods. For example, Flue Steam offers professional hand scraping as well as steam cleaning for kitchen exhaust hoods and exhaust ducts. Plus, we prove the effectiveness of our work by using a special IKECA comb to measure the depth of grease deposits before and after cleaning. One final hallmark of a professional kitchen exhaust hood cleaning company is the availability of comprehensive service for your entire air control system. This shows that the company truly understands how the cleaning they’re performing affects the rest of your system. For example, at every exhaust system cleaning visit, the pros from Flue Steam also check your exhaust fan to make sure it is clean and in good condition. This is important because without a fan drawing hot, greasy air out of the kitchen, grease deposits will accumulate faster on your exhaust hood and in your duct work and increase your risk of a fire. We can also provide grease filter exchange service, as well as maintenance and repairs for your swamp cooler and your emergency fire suppression system.